Want Increased Patience & Enhanced Intellectual Abilities? It is highly stimulating to the pineal gland located behind the third eye in the forehead. 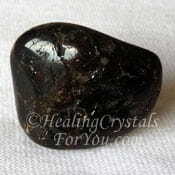 If you have the potential to develop psychic powers, it is a powerful stone to amplify many psychic gifts. 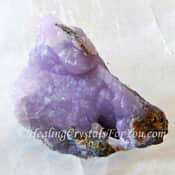 They are helpful healing crystals for you if you work in psychic employment, including if you work in the astrology field, or are a tarot reader. 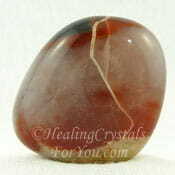 Your accuracy, in your interpretation of the information that you receive from the Divine mind, is aided by this stone. The meaning of its name comes from the name of the French paleontologist Dumortier, who it was named after. Deposits have been found in Madagascar, Namibia, Sri Lanka, Canada, Poland, France, Brazil and the USA. 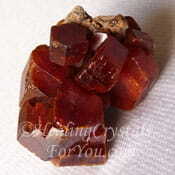 It is often found in the massive form, and may be found as a radiating aggregate. 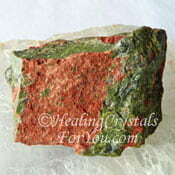 The colors of the stone range from reddish pink or brown, to violet-blue to a darker blue. 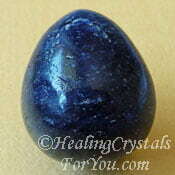 The dark blue variety of the stone is the most common, although the natural raw stone may look a little lighter. 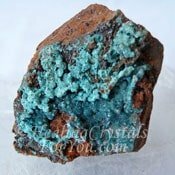 You will now find this mineral selling as an inclusion in Quartz, and these are quite beautiful crystals, see picture below. Want To Enhance Your Intellectual Abilities? 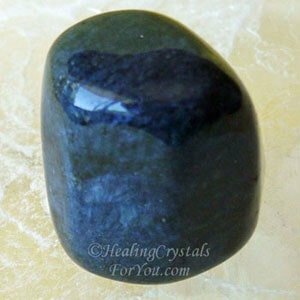 This dark blue stone, has a strong ability to aid intellectual activity within the brain, and will assist you to develop enhanced mental abilities. 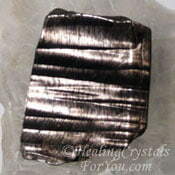 They help you to stabilize your emotions, and this is helpful as these stones can create a large degree of change. 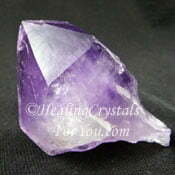 If you are willing to work with the change, these crystals bring many gifts to you. 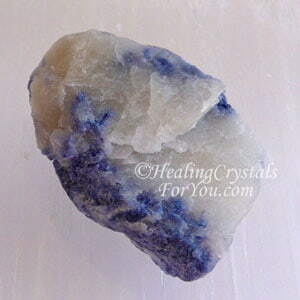 Shop for pieces of Dumortierite at Exquisite Crystals, my most reliable crystal seller. The pineal gland is located within the third eye chakra and is located behind the middle of the forehead. 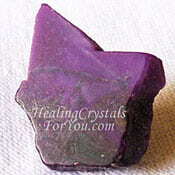 It is this area, the origin of psychic ability, that is highly stimulated by the use of this stone. They will also assist you to be patient, which is always an asset especially if you work with the public. 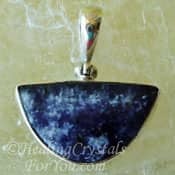 It is primarily a stone of the third eye chakra but it will also have a beneficial effect within the crown chakra and the throat chakra. 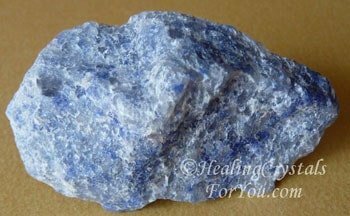 Using Dumortierite may boost your telepathic abilities, meaning it may amplify your capacity to hear the thoughts of others. 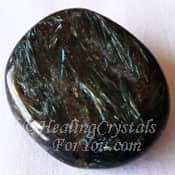 This is a stone that is excellent to stimulate the brain and the mind on many levels, so is an extraordinarily useful stone to use. By aiding intellectual activity it will help you in many different areas of your life, including using your enhanced psychic gifts that it brings through. If you want to develop your psychic powers, it may be beneficial for you to do a daily psychic meditation, holding them in your hand. 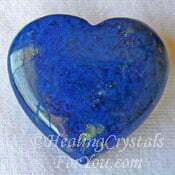 Natural crystals of Dumortierite have a strong frequency that may assist you to ﻿hear the voice of the Divine﻿. 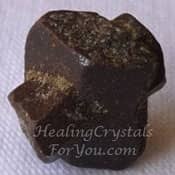 Their vibration is quite obvious, and if you are already using your psychic abilities they will enhance these quite quickly with regular use. 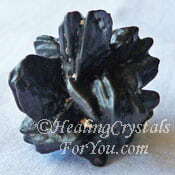 Through the action of stone's energy within the throat chakra, you gain elevated abilities to communicate more clearly. 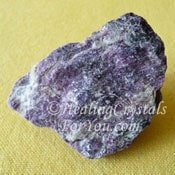 This energy may aid your psychic communication abilities, and using it may bring through past life visions, as well as enhancing most psychic skills. 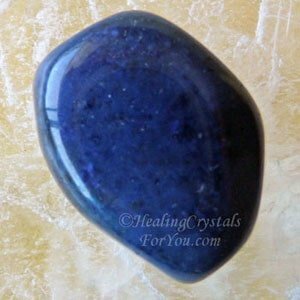 These lovely blue stones will also assist you to develop some of the less well known psychic powers, including prophetic vision, psychokinesis, psychic knowing, channeling and channeled automatic writing. 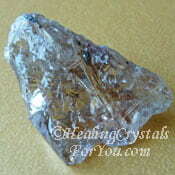 This crystal also has an extraordinary capacity to help you to acquire many psychic gifts. This includes most of the best known ones, such as psychometry, clairvoyant abilities, clairaudience aka psychic hearing and will help to amplify your intuition. 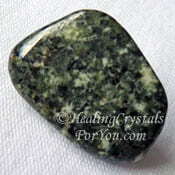 This stone is also a stone for helping those of you with addictions, to more easily work through the issues involved. It will help you with problems of addictions, by highlighting the patterns in your current life that underlie why you have these addictions. 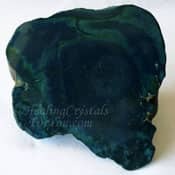 By keeping a piece of Dumortierite under your pillow at night, this will be an effective way to get the stones energy to work with you for a long period of your day. Alternatively (or as well) you may prefer to wear it during the day, just keep it within your aura to gain the most from its unique vibration. 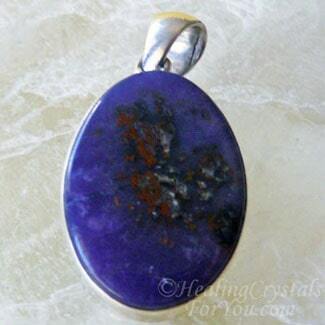 The best type to wear would be pendants and earrings, or Dumortierite stone bead necklaces. 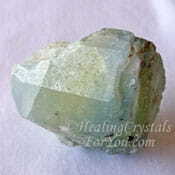 They make beautiful crystal jewelry, and as they are Leo birthstones you should be able to buy jewelry made from these stones, although they are not as common as some stones. If you wear it as close as possible to the chakra that it vibrates to the most, and the area you want to develop, this will aid you the most. 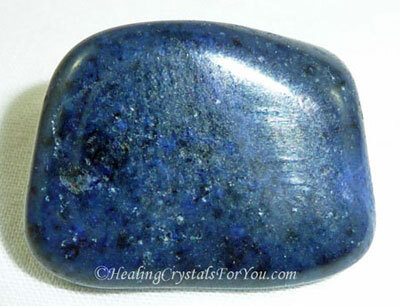 These powerful blue stones are on the zodiac birthstones list. 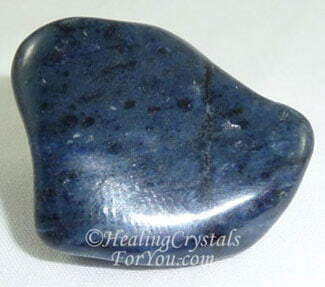 Dumortierite stones are reasonably easy to buy, so if you want, put a tumblestone of this blue stone in your pocket. This is beneficial as it helps to keep the energy of it working on you all day. 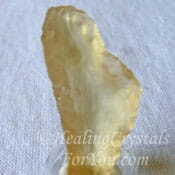 One of the best ways to use almost all natural crystals is to use them in meditation. Hold a stone in your hand when you sit down to meditate, or even better hold two, one in each hand. This may aid you to understand exactly what direction you need to take your life in, and may aid you to discover how to be psychic. 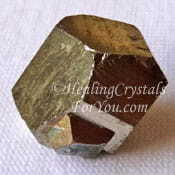 Once you begin to use them regularly they will enhance your patience and this will flow on to make the process easier. 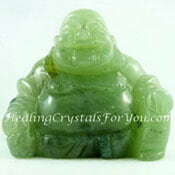 During your meditations with these crystals, it is possible that you may become attuned to the frequency of the Divine Mind. At the beginning you may not necessarily be aware of the meaning of these communications. But as you progress, it is possible that Divine guidance will start to be made available to you. "To be a philosopher is not merely to have subtle thoughts, but so love wisdom as to live according to its dictates." Henry David Thoreau. The books and the CD set shown below are excellent aids to help you if you are working on your psychic abilities, including developing your intuition, a closely related gift. In her book 'Diary of a Psychic', you can read the story of how Sonia developed her gifts, and this may give you ideas about how to develop yours. 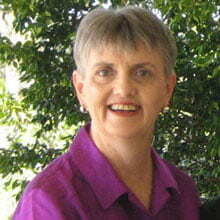 If you wish to read reviews of these Sonia Choquette books Click Here. 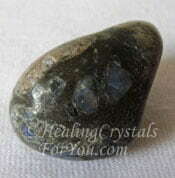 Phenacite is a high crystal energy stone that is beneficial to combine with this crystal. 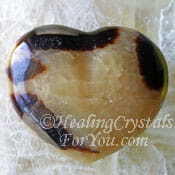 Septarian stones will also aid you in this area, as they are also beneficial for protecting you psychically. 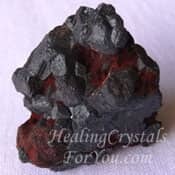 If you combine Dumortierite with Unakite, Datolite Crystals, Staurolite, Smithsonite, Hematite, Purple Amethyst or Dravite aka Brown Tourmaline, in any combination, it will be effective in helping you to beat addictions. If you are doing spiritual development work you may become ungrounded. 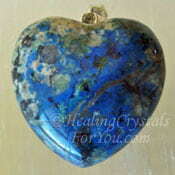 It is a good idea to ensure you regularly do spiritual grounding to make sure that you keep yourself healthy. 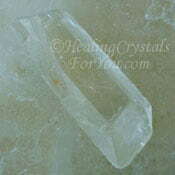 An easy preventative action is to regularly do a grounding meditation, into the earth star chakra. 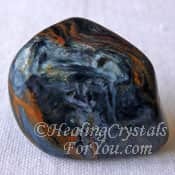 There are some stones that are both grounding and psychic protection stones, and keeping one of these on you is important when you are working with your psychic gifts. Amethyst Crystals, Black Tourmaline, Sugilite and Amber are all highly recommended for this purpose, and may also aid you in other ways. 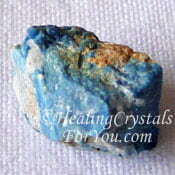 Combining this stone with either Blue Sapphire or Blue Azurite will aid your mental capacity. 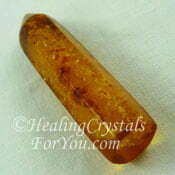 It will help you to restructure your DNA when combined with Prehnite and Golden Rutilated Quartz. 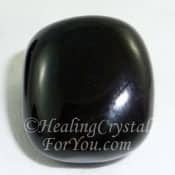 It is beneficial to combine it with other stones that help to enhance your willpower, including Sardonyx, Iron Pyrite, Preseli Bluestone, Pietersite, Orange Carnelian and Libyan Desert Glass. 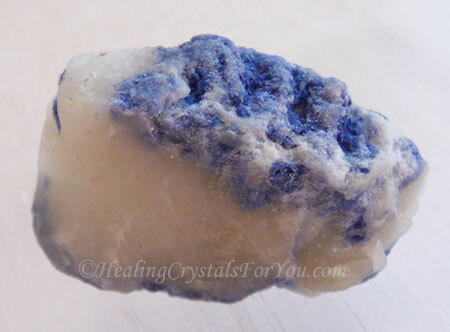 Lapis Lazuli Stones, Lazulite, Arfvedsonite, Kammererite, Euclase, Vivianite, Blue Scapolite, Prophecy Stone and Aurichalcite are crystals that are also third eye chakra stones. 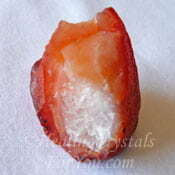 Any of the third eye chakra stones are effective used in combination with this stone to deepen your psychic abilities.